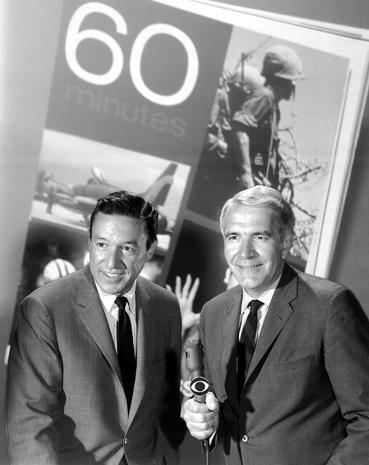 It was fifty years ago today- September 24, 1968 the television news show 60 Minutes made its debut on CBS TV. 60 Minutes made its debut at 10PM on a Tuesday. The hosts were Mike Wallace and Harry Reasoner. The creator and producer of the show was Don Hewett who had produced the first televised presidential debate between Jack Kennedy and Richard Milhous Nixon back in 1960. Hewett would remain producer until the mid 2000’s. Mike Wallace- remained a regular until retiring in 2006 and still made appearances on the show until 2008. When I hear 60 Minutes I think Mike Wallace. Of all the hosts they have had over the years the one I wouldn’t want showing up at my door for an interview would have been Wallace. Reasoner would be host from 1968 until he left for ABC in 1970 and then again from 1978-91. In 2002 TV Guide ranked 60 Minutes the 6th greatest TV Show of all time. It is of course still an on going series going into their 51st season and nearly 2400 episodes. I remember over here in Australia watching back in the early eighties a report from the Aussie 60 Minutes crew on the dangers of hitchhiking (that’s how long ago it was ’cause sure as eggs no one thumbs a ride these days). It scared the bejesus out of me all those years ago. I still watch 60 Minutes today.